Welcome to the Bryce Canyon National Park Information Guide. The closest major airport is Salt Lake City International Airport located 260 miles North of the park. Regular commercial flights serve Cedar City (87 miles), St. George (150 miles), Salt Lake City (270 miles), as well as Las Vegas, Nevada (270 miles). The Bryce Canyon Airport (4 miles), operated by Garfield Country, has commercial flights from Las Vegas. Phone: 435-834-5239 for current carriers and schedules. Private planes are welcome at this uncontrolled airport. 1. I-15 South to Stateroad 20 East to Highway 89 South to Stateroad 12 East to Stateroad 63 South to the park. 2. I-15 South to Highway 89 South to Stateroad 12 East to Stateroad 63 South to the park. Take Stateroad 12 West to Stateroad 63 South to the park. Travel to I-15 South and follow the directions above or take I-15 North and follow the directs for the South listed below. 1. Travel to I-15 North to either Stateroad 9 East or Stateroad 14 East and then take Highway 89 North to Stateroad 12 East to Stateroad 63 South to the park. 2. Take 89 North to Stateroad 12 East to Stateroad 63 South to the park. Shortly after 1900, visitors were coming to see the colorful geologic sights, and the first accommodations were built along the Paunsaugunt Plateau rim above Bryce’s Canyon. By 1920 efforts were started to set aside these scenic wonders. In 1923 President Warren G. Harding proclaimed part of the area as Bryce Canyon National Monument under the Powell (now Dixie) National Forest. In 1924 legislation was passed to establish the area as Utah National Park, but provisions of this legislation were not met until 1928. Legislation was passed that year to change the name to the new park to Bryce Canyon National Park. Congress created Bryce National Monument in 1923. In 1928, Bryce Canyon was designated Bryce Canyon National Park. 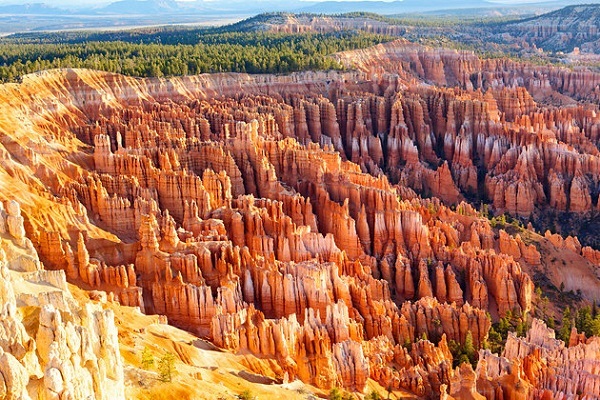 Bryce Canyon National Park consists of 37,277 acres of scenic colorful rock formations and desert wonderland. The majority of park visitors come during June to September and are lowest in December through February. Each year the park is visited by more than 1.5 million visitors from all over the world. Languages as varied as the shapes and colors of the hoodoos express pleasure in the sights. The Paiutes were living throughout the area when Captain Clarence E. Dutton explored here with John Wesley Powell in the 1870’s. Many of today’s place names come from this time. Dutton’s report gave the name Pink Cliffs to the Claron Formation. Other names – Paunsaugunt, place or home of the beavers; Paria, muddy water of elk water; Panguitch, water or fish; and Yovimpa, point of pines – were derived from the Paiute language. The Paiutes were displaced by emissaries of The Church of Jesus Christ of Latter-Day Saints, who developed the many small communities throughout Utah. Ebenezer Bryce aided in the settlement of southwestern Utah and northern Arizona. In 1875 he came to the Paria Valley to live and harvest timber from the plateau. Neighbors call the canyon behind his home Bryce’s Canyon. Today it remains the name not only of one canyon but also of a national park. Ponderosa pines, high elevation meadows and fir-spruce forests border the rim of the plateau, while panoramic views of three states spread beyond the park’s boundaries. This area boasts some of the nation’s best air quality. This, coupled with the lack of nearby large light sources, creates unparalleled opportunities for star gazing. Elevations ranging from 6,000 feet to 9,000 feet and diverse soil and moisture conditions influence the park’s plant life. More than 400 species grow in the park. At the park’s comparatively high elevations, many wildflowers that bloom in spring elsewhere may bloom late in summer here. Half-mile section of the Rim Trail between Sunset and Sunrise Points is suitable for wheelchair and those who have difficulty walking. Parking displaying the International Access Symbol. Many ranger guided interpretive programs (check at the visitor center for applicable programs). Captioned visitor center slide program. Bryce Canyon General Store and Lodge are accessible as are the gift shop, laundry, showers and restaurant. Obtain a backcountry permit for any overnight use at the visitor center from 8:00 am until two hours before sunset. Building ground fires is prohibited. Pets are prohibited on park trails and in the backcountry. Bicycles are restricted to paved roadways and there are NO bike lanes in the park. Camping is allowed in campgrounds and at designated backcountry sites with a fee permit. Building wood or ground fires is prohibited in the Backcountry. Bryce Canyon Lodge has a restaurant, gift shop and post office. Groceries, film, quick meals and camper supplies are sold at the general Store at Sunrise Point. There are also restaurants in the local communities listed above. There are numerous trails to hike in Bryce Canyon National Park. Hiking is a great way to both see and enjoy the park. Stay on established trails. Carry out all refuse. Lodging in Bryce Canyon National Park consists of Bryce Canyon Lodge and two Campgrounds. The Lodge has 114 rooms, including suites, motel rooms and cabins. The lodge has a restaurant, gift shop and post office. There is a snack bar at the General Store at Sunrise Point. Pets are not recommended in Bryce Canyon National Park. Pets are not allowed on any of the park trails or overlooks. Pets must be on a leash at all times, (no longer than 6 feet), and never left unattended. It is not advisable to leave pets in vehicles. Desert heat can produce dangerous temperatures inside of vehicles, jeopardizing the health of your pet. There are no kennel services within 80 miles of the park. Picnic tables, water and restrooms are available at Sunset Point, Yovimpa Point and the south end of the North Campgrounds. Picnic tables are also located along the road to Rainbow Point, but there are no amenities. Bryce Canyon National Park is in a desert climatic area. The temperatures range from single degrees for lows in the winter to the high 90s in the summer. Annual precipitation averages only 18 inches / 7 cm.